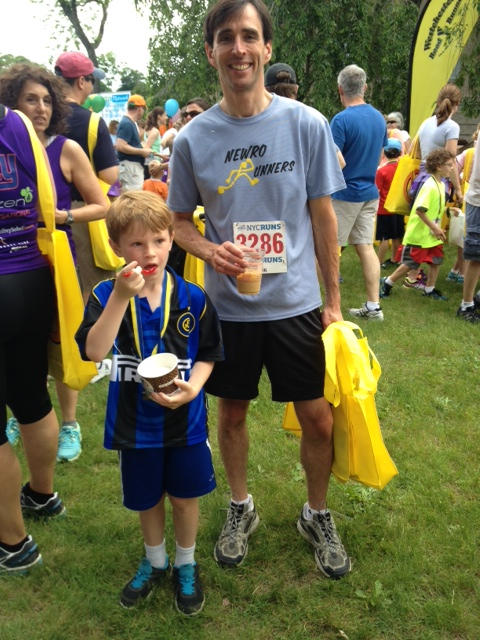 Noam Bramson with Owen Bramson, enjoying a well-earned post-race treat. Jeremy, Owen, and I ran the second annual North Avenue Mile this morning. It was a terrific event – hundreds of runners and walkers, dozens of sponsors, and lots of good causes for which money was raised. My time was seven minutes and something. Jeremy finished just a little behind me. The family star, however, was Owen, who had pledged prior to the race to sprint the whole way. “Pace yourself,” I advised him, “you’ll run out of gas before the end.” Well, he completely ignored my advice, sped the whole way, and – wouldn’t you know it – finished a good 30 seconds ahead of me. So much for my wisdom. Big thanks and congratulations to the volunteers of New Ro Runners for putting it all together. A really great day.